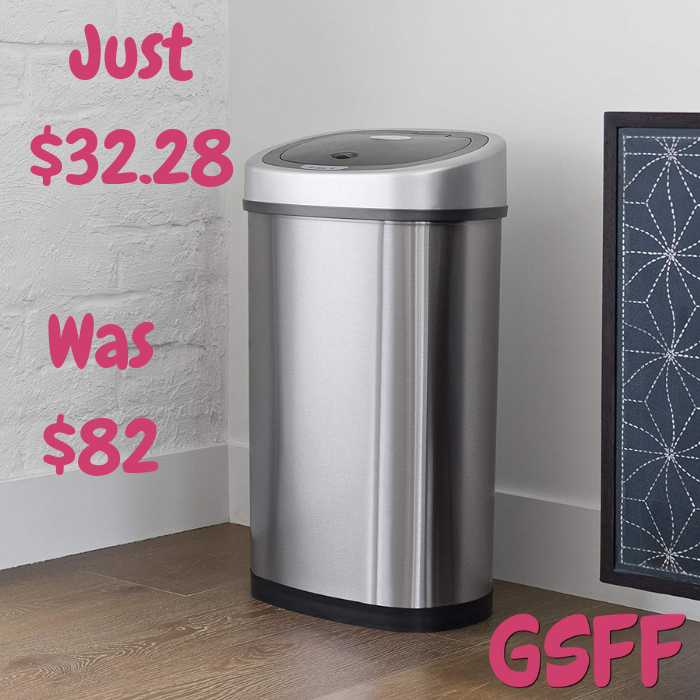 Touchless Trash Can Just $32.28! Down From $82! Shipped! You are here: Home / Great Deals / Amazon Deals / Touchless Trash Can Just $32.28! Down From $82! Shipped! Amazon is currently offering this Automatic Touchless Trash Can for just $32.28 down from $82 PLUS FREE shipping! This 13 Gal Stainless Steel touchless trash can is designed and engineered by NINESTARS, the world’s first legal patent holder. With its sleek oval fingerprint-resistant design, it can be used in almost any place, such as the home, office, kitchen, bedroom, dorm room or a kid’s room. This durable trash can uses the most advanced sensor technology which can be found in all Ninestars trash cans. Pass your hand or debris within ten inches or a 130° angle from the infrared sensor and the lid will automatically open. The lid will remain open if debris or hand remains within the range of the infrared sensor. Three seconds after your hand moves away from the lid, it will close automatically. Power lasts up to 6 months in normal daily usage. It includes a ring liner to keep trash bag from public view for a neat and clean appearance. 【High Quality Materials】Water-resistant infrared motion sensor prevents moisture or any accidental spills from damaging the unit. Plus finger-print resistant stainless steel base helps keep the can clean. 【Advanced Technology】 Delay sensing technology preserves battery life and prevents any unnecessary opening from pets, children, or walking by. Soft closing function for longivity of product life. 【Touch-free Motion Sensor Lid Clouser】Seal odor in and eliminate cross-contamination of germs. Requires 3 C batteries (not included), Alkaline battery highly recommended for best performance. 【Ease and Convenient】Removable ring liner holds trash bag sturdy in place and prevents bag from overhanging for a neat and clean appearance. Use any standard trash bags or NINESTARS custom trash bags NSTB-13-30.